While the public and biologists are enjoying the rare opportunity to view sockeye salmon in Idaho's upper Salmon River this year, an Idaho State University research professor has taken looks at Gem State sockeye salmon runs going back thousands of years. Today's fisheries managers are thrilled by the return of hundreds of fish to the Sawtooth Valley, but historically the run consisted of tens of thousands of sockeye, according to Idaho State University research professor Bruce Finney, Ph.D. 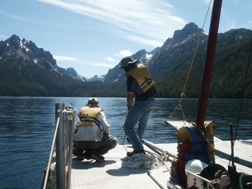 Researchers on Redfish Lake in process of taking sample. Photo by Jason Addison. Photos provided by Mark Shapley. As of early August, more than 850 rare sockeye salmon had passed over the Lower Granite Dam, the last barrier on the Snake River that salmon must pass before entering Idaho. Fisheries biologists predict as many as 700 fish could return to the Sawtooth Fish Hatchery near Redfish Lake, which is near the town of Stanley. To get to this hatchery the fish travel nearly 900 miles. Some years there are only single-digit or zero returns of the sockeye. The largest number to return to central Idaho in a year since 1985, when biologists starting counting the runs, was 257 sockeye in 2000. Since 1985, just 352 wild and hatchery-origin sockeye have returned to the Redfish Lake area. Redfish Lake is named for sockeye, which turn a reddish color when they spawn. While this relatively strong run is encouraging to those who want to save the fish, this year's run is a small fraction of the size of sockeye runs that historically returned to spawn in the lakes of the upper Sawtooth Valley, including Redfish, Petit and Alturas Lakes. According to Finney from 25,000 to 40,000 sockeye historically spawned annually in Redfish Lake alone prior to the 1900s. Scientists using the equipment on the deck of one of the drilling boats. Photo by Dave Gilbert. Finney bases this calculation on work he has done examining the sediment cores from lakes using a machine called a mass spectrometer. Mass spectrometers are instruments that can measure the masses and relative concentrations of atoms and molecules in chemical compounds and other samples. Spectrometers accurately measure the different types of isotopes of the same element such as carbon or nitrogen in biological or geological samples. Finney has developed a technique using mass spectrometers to reconstruct the salmon runs in the past. Salmon have a signature type of nitrogen, recorded by nitrogen isotopes, which scientists can use to positively identify as originating from the salmon. When the salmon die and they decompose they release nitrogen, which is in turn taken in by algae that end up in lake sediments. High salmon runs correspond to higher concentrations of these nitrogen deposits; lower concentrations of nitrogen in deposits represent smaller runs. The sediments on lake bottoms can be dated using radiocarbon dating, an accurate method for dating materials and by identifying ash layers from known volcanic events. So far, Finney and his colleagues have studied core samples from some of the larger lakes in the upper Sawtooth Valley, including Redfish Lake, dating back about 2,000 years. Drilling rig on Petit Lake. Photo taken by Jason Addison. Although there were fluctuations, sockeye runs until about a century ago were consistently high, but populations crashed as Old World settlers developed the region. Finney's mass spectrometer measurements confirm anecdotal and eyewitness accounts of what led to the precipitous demise in the Idaho upper Salmon River sockeye population: the creation in 1910 of the Sunbeam Dam, located about 15 miles downstream of Stanley. "The most dramatic decline in salmon runs occurred when the Sunbeam Dam was built," Finney said. "Its creation just overwhelms any naturally occurring fluctuations that occurred previously." The creation of the Sunbeam Dam shows how Finney's technique can be used to help confirm other data about Pacific salmon runs that has been collected in the last 100 to 150 years. However, his data can also be used to help create a picture of what runs were like prior to modernization in the New World, when commercial fishing increased, rivers were dammed and there were other numerous large-scale factors that potentially altered salmon runs. The information Finney collects about pre-industrial age salmon runs may be of even more use. Based on data Finney collected while doing a similar study in Alaska, fishery managers in one area changed their management goals based on historical salmon runs from prior to when fishery records were kept. This is one example of the large number of ways that Finney's research is applicable to current management. In completing his studies on various lakes from Alaska to the Pacific Northwest, analyzing runs that have occurred as far back as 10,000 years, Finney has confirmed that salmon population fluctuations occurred regularly in response to naturally occurring climatic events. This is also useful information because it can give managers a framework about what happens to fish runs in a particular area in response to a warming or cooling trend. That information could potentially be used by current fisheries managers to develop harvest guidelines for particular fisheries. Finney is involved in a major research project with researchers from three other universities to synthesize all the results from lake core sample studies that have been obtain in Alaska, British Columbia, Yukon Territories and in the Pacific Northwest. The results of that study could help researchers build a sweeping view of salmon run patterns occurring over a larger time and geographical scale.